The Cirlock SLH-80 tamper proof stainless steel lockout hasps feature nickel plate finish for multiple lockout points on energy sources. 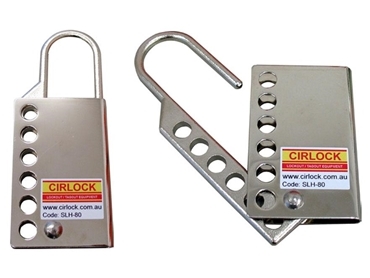 The tamper proof lockout hasps cannot be pried open and can accommodate up to 6 padlocks with up to 8mm shackles. Ideal for use in all industrial environments, the SLH-80 stainless steel lockout hasps feature hasp shackles 5mm thick and 25mm wide. The fully opening shackle/ body makes the lockout hasps very easy to use. Ferret.com.au is Australia’s leading hub for the manufacturing, industrial and mining industries. Owned and operated by Prime Creative Media, Ferret.com.au provides a comprehensive central online source containing the latest product, supplier and industry news updates attracting more than 70,000 unique visitors each month. Ferret.com.au is the official partner of Australian Mining and Manufacturers' Monthly. Copyright © Prime Creative Media (v6.15). All material on this site is subject to copyright. All rights reserved. No part of this material may be reproduced, translated, transmitted, framed or stored in a retrieval system for public or private use without the written permission of the publisher.